We have seen guest houses that are built separately from the original home. This way, guests are given the freedom and privacy they need while they are in your house. But guest homes aren’t the only ones that can be built detached from the primary house. There are also pool houses, garage, sheds and others. But did you know that a house extension can actually be built as a separate structure? Well, that sounds weird, right? 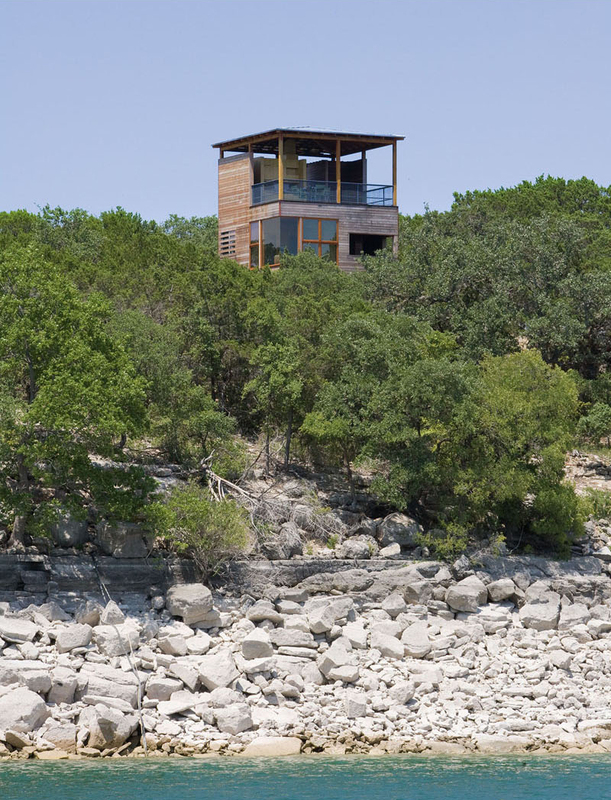 This is what the owners of a cabin in Austin, Texas decided to do. Instead of extending their home to a larger living area, they decided to build a new structure near their cabin. And they called it the Tower House because it is indeed tall like a tower. Unique feature: Instead of adding an extension to the original home, a tower house was built near it. 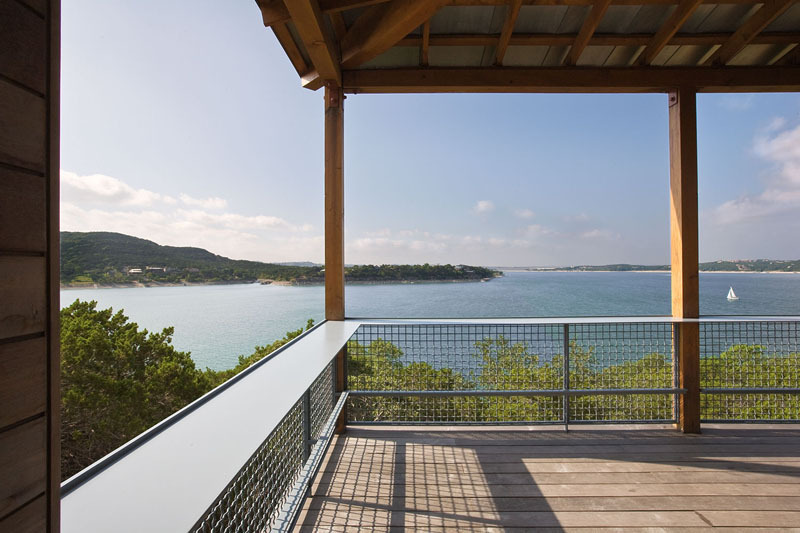 In considering an addition to the original home, the homeowners decided to add a tower so they can take advantage of the views, minimize the footprint on the site and accommodate the rising floodplain elevation. 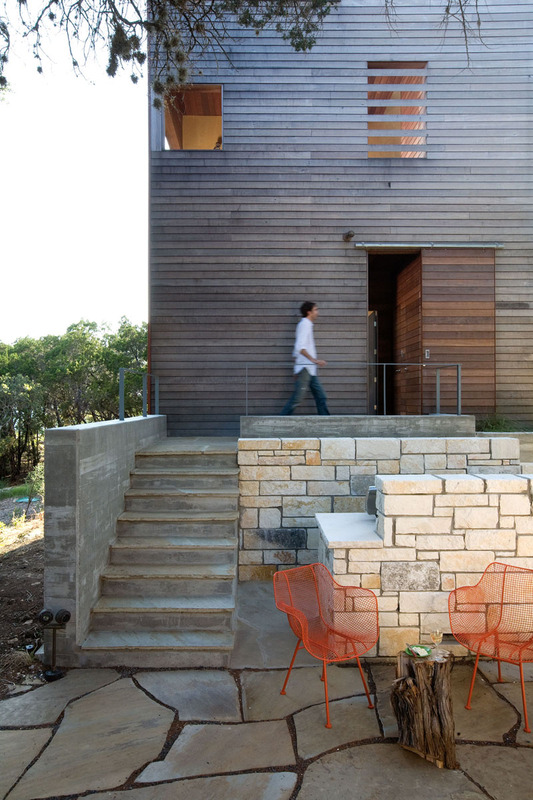 Instead of building an extension onto a 1930’s limestone cabin, the homeowners created a vertical tower of wood nearby. Isn’t it a good idea? 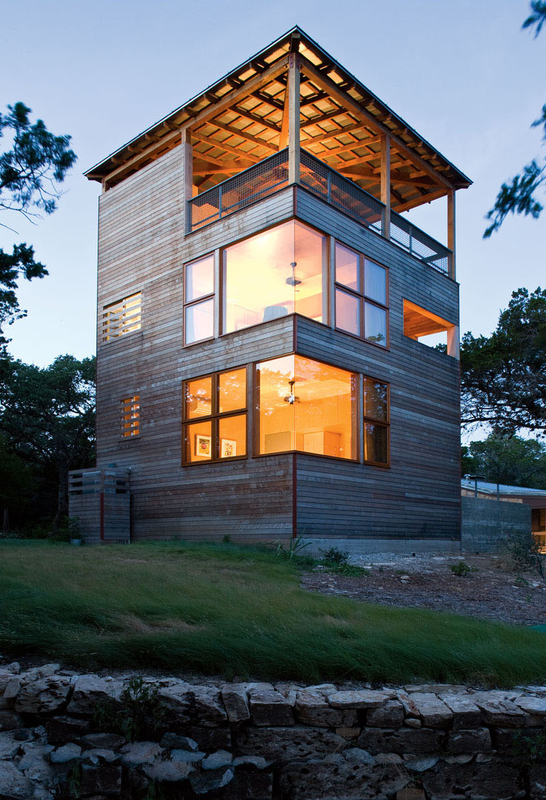 The tower is connected to the cabin through a pathway. The tower rises up out of the forest which might remind you of Rapunzel’s tall tower. Only that this one has doors and windows. 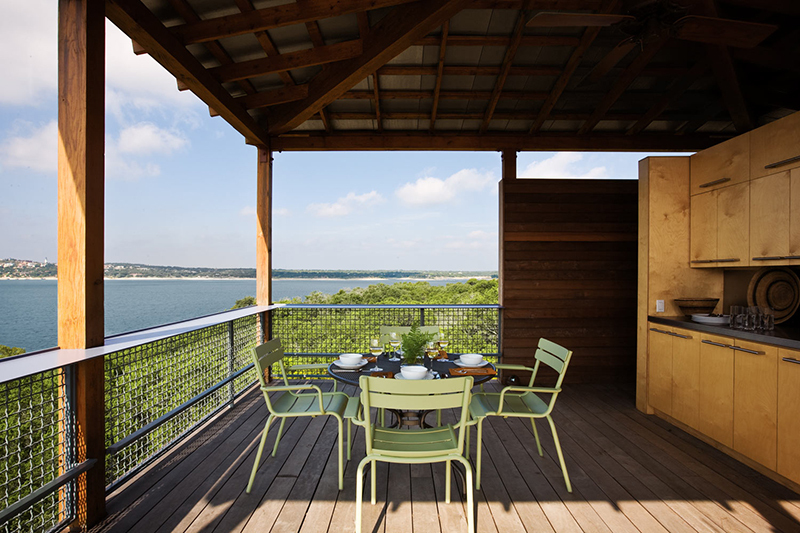 The tower provides views of Lake Travis, which is barely visible at ground level through the surrounding trees. A flagstone path connects the two buildings. It also features concrete stairs that lead up to the entrance of the tower. 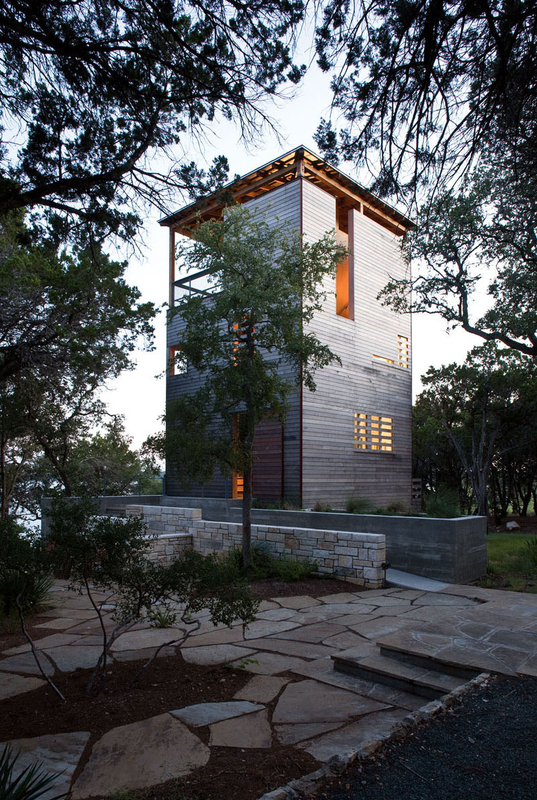 The exterior of the tower is clad in Massaranduba wood, which is darker than the wood in the home’s interior. The top floor of the tower features a shaded terrace that sits 30 feet above the ground. From here, one can enjoy the beauty of nature around it. Very relaxing, right? There are two small bedrooms in the house wherein one of the bedrooms is on the first floor while the other one can be found on the second floor. The interior walls of the tower are covered in Birch plywood which makes the interior wood lighter than the darker exterior wood on the facade. 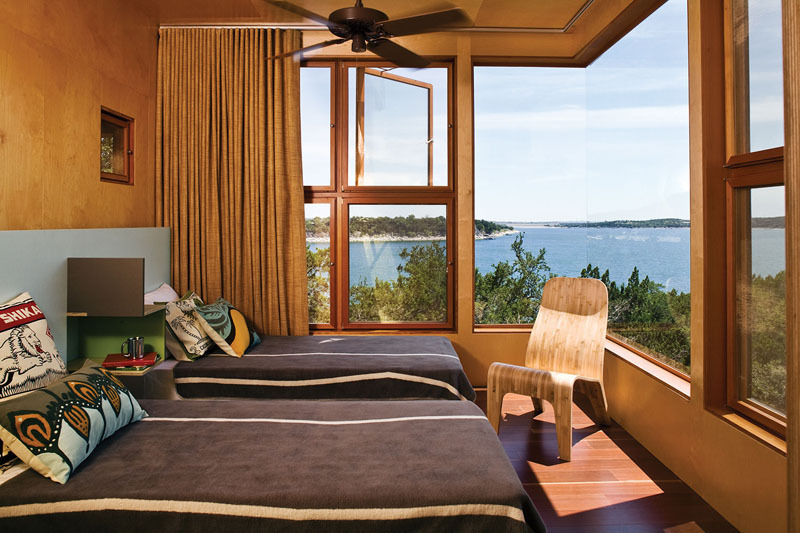 One can get wide views of the woods and lake through large corner windows that are featured in each of the bedrooms. The terrace has a dining area with pastel green chairs and a round dining table. Aside from that, there is also a kitchen in the area. It would be nice to dine here with a good view of the lake. Upon entering the house, it has a small arrival space which seems to invite guests to walk up a shaded stairs. The stairs are positioned between the outside wall and the interior rooms. 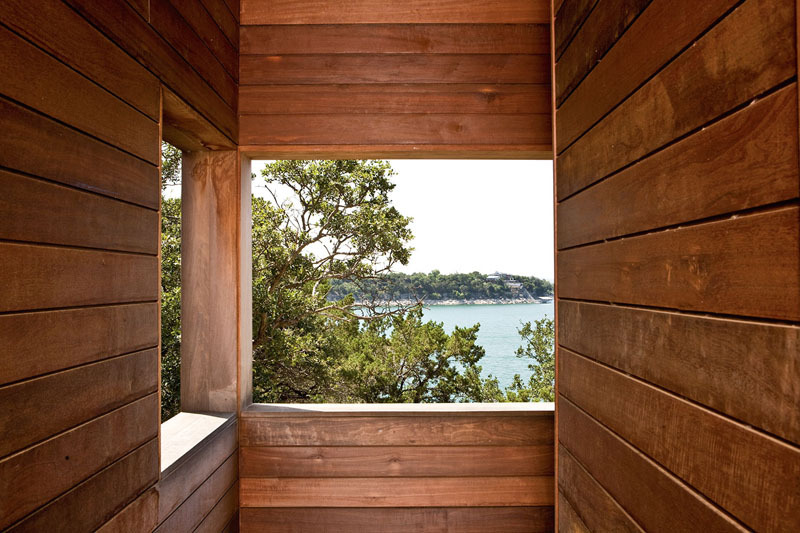 There are also rectangular openings near the bedrooms which circulate air and offer views of trees, sky, and lake. If guests are tired of using the stairs, they can also use a small elevator. You can get a better look at the materials used for the Tower House. Notice the roofing, the wooden siding, and even the wooden interior. Every bedroom in the house has its own bathroom. 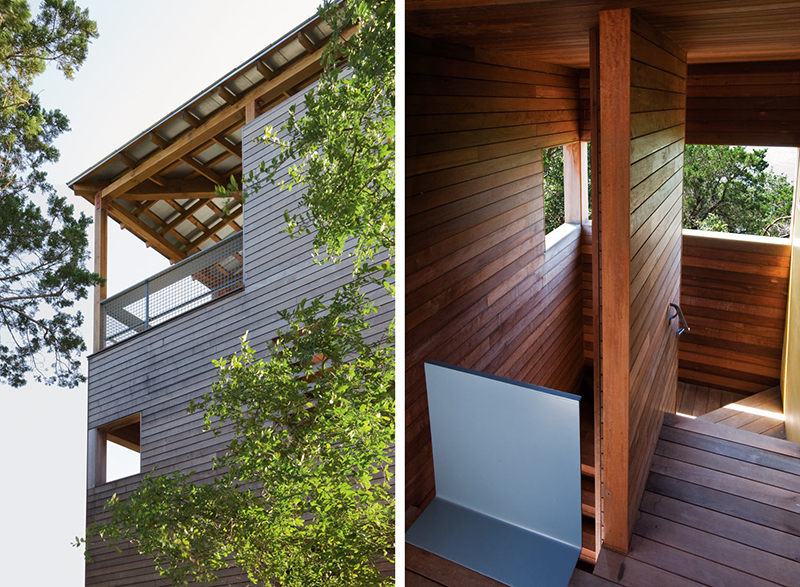 It features small windows that provide views from the area and to add natural light into it. However, the windows are small enough to provide privacy at the same time. 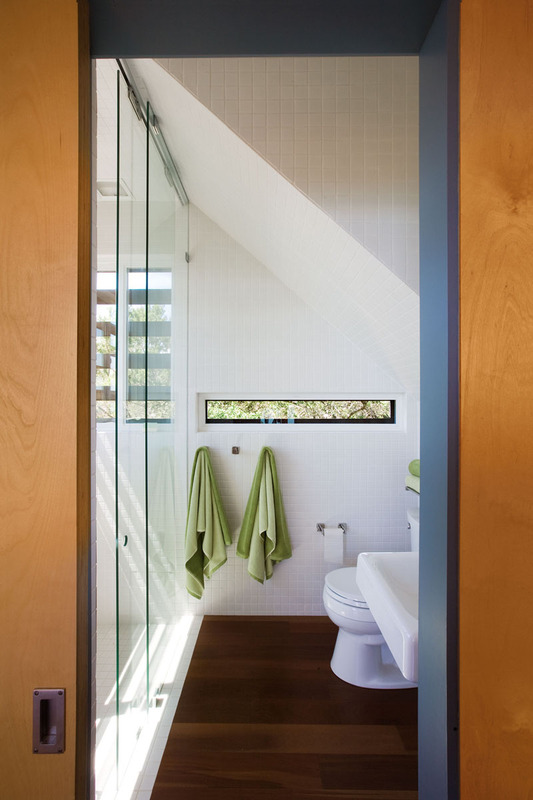 Floor-to-ceiling white tiles are used in the bathroom which helps to keep the interior bright. This project is a solution to the homeowner’s request for an additional two bedrooms with baths and larger living area. This was achieved through the simple design of the house. This unique contemporary home is designed by Andersson-Wise Architects. This design actually shows us that you can come up with a simple home design which can also offer a cozy and homey aura. Like other complicated home designs, this can also be a good place to rest, sleep, relax, and even spend time with the family and friends. 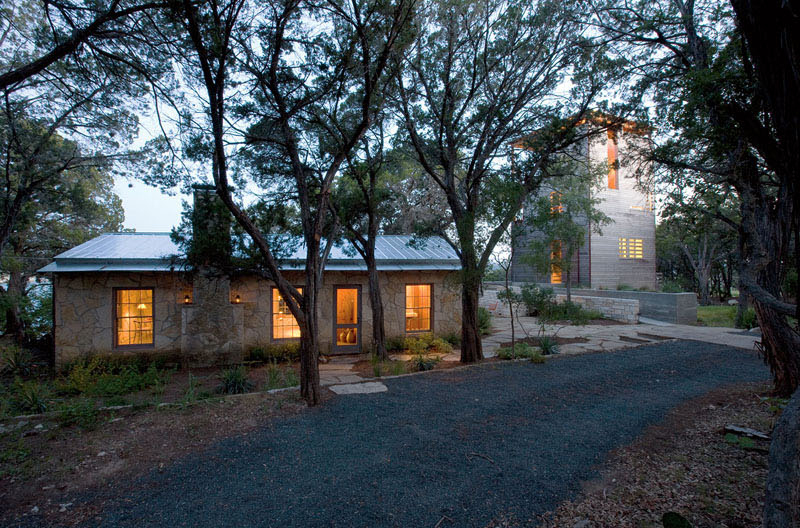 The Tower House gives us an idea of how we can utilize a small lot area without compromising design and aesthetics. Do you think you would consider a house like this for your family?